12V is fantastic for our Choruses, Comps, KOT, POT, and most analog pedals. 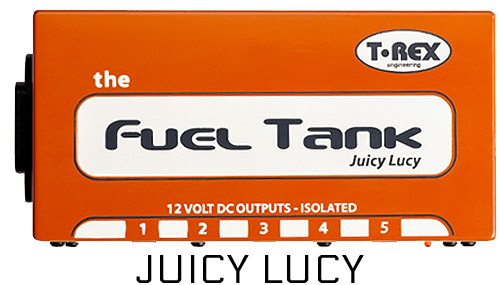 Tank Juicy Lucy will power every T-Rex pedal you own - and then some. Lucy is built from the ground up to deliver the tone - your tone. Did we mention isolated outputs? with no hum or electrical interference. 12vDC power supplies are great for use with the Analog Man Chorus, Compressor, Overdrive, and Distortion pedals. It also works with the Maxon AD-900 and older Boss ACA type effects.